They’re my ducks. Of course I know their secret weaknesses. And I’m not above bribery for the sake of a bad joke. I appreciate everyone’s patience, truly! Well, it’s nice to know that at least one of the Rustys can enjoy a good… er, bad pun. Heh. One can only wonder what kind of pane he’ll inflict on us next. My sister pointed me to your site. It is absoultley amazing! 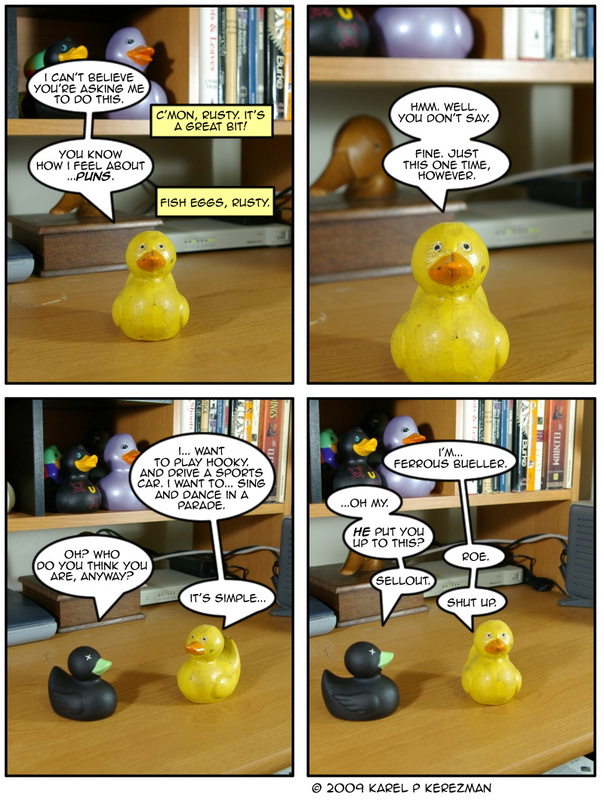 I keep thinking od doing something similar with all my Duckies, btu they are far too strong willed to stay where i put them, they all seem to be anti-ownership. Maybe i need to become a tryant and they will then listen and not make all the mess in my house. But brilliant webcomic!